I have always loved stuffed mushrooms. Even when I was a child I remember I couldn't wait until my grandmother took them out of the oven, I was first to try them! When my grandmother made them I was very young and had no interest in cooking but I can remember them tasting like gluten filled Stove Top stuffing mix and to this day I remember after eating them wanting to go take a nap! These day I steer way clear of Stove Top stuffing and most commercial foods that have ingredients that we shouldn't be injesting. I love appetizers, I think more than a regular meal actually because I like to relax with a glass of wine and some "finger food". After trying many gluten free appetizer recipes for sausage stuffed mushrooms I finally ecied to just take an evening in the litchen and create my own. I know that corn flour had a bit of hype amoungst many Celiacs as not being safe for a gluten free diet but my further research showed that even though corn has a protein in it, it is in fact gluten free and safe for a gluten free diet (as ALWAYS check wuth your Doctor before making a decision). 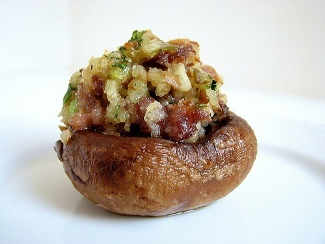 I think a bit of an italian tasting sausage stuffed mushroom you will find, but if you don't just eliminate the parmesan cheese and parsley and add bacon instead of sausage. Check out my video on youtube! Remove the stems from the mushrooms and set aside. Wash mushrooms throughly. Cut up the stems into small chopped pieces. Using a frying pan saute the sausage until browned. Add the cup up stems, parsley, corn flour, and parmesan cheese and cook until warm. You can also add any of your favorite spices. I like to add garlic powder and basil. Put in bowl and set aside. Place whole mushrooms on a baking sheet. Using a spoon stuff mushrooms with the filling. Top with parmesan cheese and bake in oven for 20 minutes. After the 20 minutes place under broiler for tweo minutes to get extra crispy. Serve these at your next get together and watch them disappear. Your guests will beg you for the recipe!